‘The Illumination Of Ursula Flight’ is Anna-Marie’s debut novel and what a debut novel it is. I read the synopsis and I was intrigued because it seemed different to most of the books I read and well they do say a change is as good as a rest. I opened the book and began to read. I couldn’t help but take to the character of Ursula Flight from the first moment I met her as it were. The story begins in 1664 when Ursula is a little girl and follows her life down through the years from childhood to adulthood and beyond. I loved the part where Ursula is thrilled to bits to make a friend although the situation has been manipulated a bit. Ursula is fun, she is feisty, she is determined, she is strong, she is ambitious and if she sets her mind to something, she is not easily dissuaded and she certainly won’t be stopped. Ursula wants a different life than that of her mother, who has spent most of her married life pregnant and not all of the pregnancies ended with the birth of a healthy baby. I couldn’t help but cross my fingers and hope that Ursula would eventually get the life that she so deserves. Does she achieve the life she deserves? Well for the answer to that question you are just going to have to read the book for yourselves to find out as I am not going to tell you. If there’s one thing this Ginger Book Geek likes, it’s historical fiction. I haven’t really studied the 17th Century in any detail although I do have a basic knowledge. Anna-Marie uses such powerful and vivid descriptions that transported me back to that time with all the relevant sights and smells. By the time I finished reading, I really felt as though I had learnt something. ‘The Illumination Of Ursula Flight’ is certainly a different and quirky read and it wasn’t entirely what I was expecting. I don’t mean that in a bad way- far from it because the book was better than I had expected. I was hooked on this book by the time I got to the bottom of the first page and because I had clicked with the character of Ursula so well, I couldn’t stop reading. I would pick up the book with the intention of only reading a couple of chapters but that intention soon flew out of the window because I would still be sat there half a dozen chapters later. I read this book in bursts and it seemed to take me next to no time to get through the book. When I was reading, I didn’t realise just how quickly the pages were turning and the time was going. 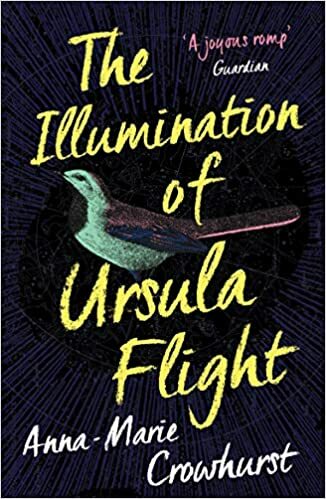 ‘The Illumination Of Ursula Flight’ is very well written and I had trouble believing that this is a debut novel because the author has a very confident and polished writing style. The author certainly knows how to grab your attention and keep it all the way through the book. She describes the characters so well that the characters seemed to jump off the page and spring to life as it were. In short I thoroughly enjoyed reading ‘The Illumination Of Ursula Flight’ and I would recommend it to other readers. I look forward to reading Anna-Marie Crowhurst’s next book. The score on the Ginger Book Geek board is a very well deserved 4* out of 5*.